We are always here to help! Please contact us with any questions or concerns regarding our products, your account and billing. We bring you a diverse group of leaders in investment advice. Subscribe Now! Copyright © 2019 InvestorPlace Media, LLC. All rights reserved. 9201 Corporate Blvd, Rockville, MD 20850. To receive further updates on this SPDR Gold Shares (NYSEARCA:GLD) trade as well as an alert when it’s time to take profits, sign up for a risk-free trial of Maximum Options today. This morning I am recommending a bullish trade on SPDR Gold Shares (NYSEARCA:GLD). I’ve recommended trades on GLD when the economy looks like it is struggling before, and I think now is another good chance for traders to look to precious metals and commodities. Many economies across Europe and Asia are on the decline. The economy in the United States is still prospering, but eventually the situation for the broader world economy is going to begin to weigh on the U.S. Whenever the economy stalls, commodities like gold are a good place for investors to turn. As the value of currencies falls–like the U.S. dollar–the price of gold and other precious metals usually goes up. With continued concerns about U.S.-China trade and slowing earnings growth, my outlook is cautious. The U.S. dollar stalled last week on concerns about trade and another potential government shutdown. Global growth is lean, and a shutdown would only add to the concerns investors have after the European Commission downgraded its economic forecast for the European Union economy. The European Commission decreased its expected growth rate from 1.9% to a rate of only 1.3%. The outlook for Italy was particularly worrisome, as the 2019 expected growth rate was slashed an entire percentage point — from 1.2% to just 0.2%. My personal projection is that the EU will fall into a recession sometime this year, if it isn’t in one already. At a time of global recession, precious metals are a good place for investors to seek safety. GLD started to rally in early December, and it has been in a well-defined upward channel since. The stock hit some resistance at the $125 level, and dropped below $123. The $123 level has acted as both support and resistance for GLD in the past, and if it can rise above $123 this week, GLD could continue rising. 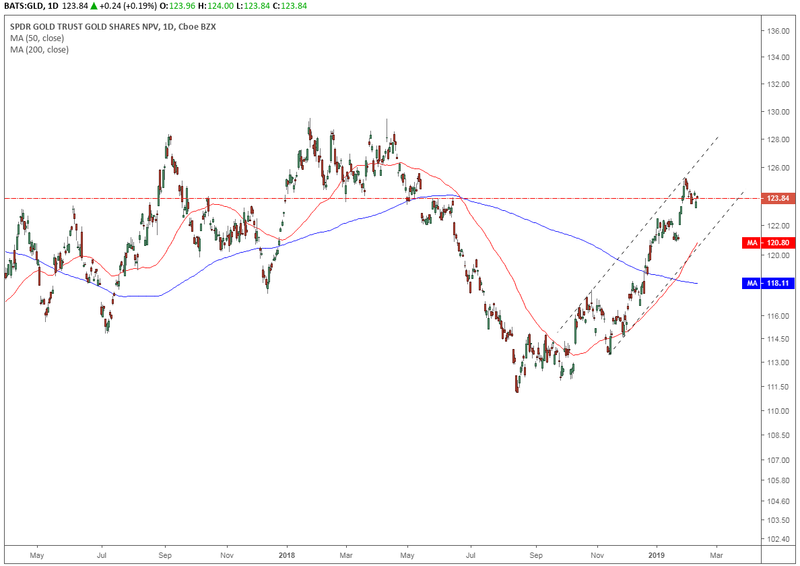 This morning’s recommendation is a cheap way to add precious metals to our portfolio, and the recent downturn in GLD gives us a great entry point before it heads higher. Using a spread order, buy to open 1 GLD March 22nd $125 call and sell to open 2 GLD March 22nd $128 calls for a net debit of about $0.20. Note: There are several March expirations available for GLD options. Be sure you are opening the weekly options that expire on Friday, March 22, 2019. A ratio debit spread is simply a way to lower the cost of buying options, as the two options that you sell to open (short) help offset the cost of the option that you buy to open. Therefore, this ratio call debit spread is a way to lower the cost of establishing a bullish call option trade. Many brokers will require the use of margin and/or a set amount of reserved capital to execute a ratio debit spread; contact your broker directly for specific requirements. Because you are short a naked call in this ratio call debit spread, one risk is that the underlying stock could unexpectedly move up sharply. If that happens, we would need to buy back to cover and close the naked call option for a loss. The other risk due to the naked call is if the stock moves up sharply the call could be assigned. This means that for every 1 call option we sold to open (shorted), we would need to buy 100 GLD shares on the open market at an unknown higher price and then sell the shares at the $128 strike price for a loss. So, this is inherently a higher risk play. Keep your positions small. Follow our Facebook page to receive each Trade of the Day direct to your News Feed — and join the conversation. Ken Trester is editor of the popular Maximum Options program. Trester has been trading options since the first exchanges opened in 1973 with a winning streak that goes back to 1984 with money-doubling average annual profits since 1990. Article printed from InvestorPlace Media, https://investorplace.com/2019/02/now-is-the-time-to-take-a-position-in-gld/. The Market Is Strong, Even With Rising Risks — What to Buy Now? Financial Market Data powered by FinancialContent Services, Inc. All rights reserved. Nasdaq quotes delayed at least 15 minutes, all others at least 20 minutes. Copyright © 2019 InvestorPlace Media, LLC. All rights reserved. 9201 Corporate Blvd, Suite 200, Rockville, MD 20850. Not Yet a Premium Subscriber?